There was a time when the neta was a staple stock Bollywood character—a kurta-waistcoat, Nehru topi-wearing scheming caricature of corruption. He got lost somewhere between multiplex-friendly plots and a new wave of content-driven cinema. But a resurrection is underway. And as the lines between fact and fiction are overlapping rapidly in our post-reality age, India’s film industries have been busy churning out a new formula—the neta biopic, along with other films with a sprinkling of our politicos. It phases out the stock characters and oblique references to politicians with promise of the real stuff: our netas, up close and fact-fictional. The timing is opportune too. While some of them are unabashedly hagiographic accounts intended to lionise the central protagonists, dead or alive, others are downright hatchet jobs executed with clinical precision to mock them. But the overall objective is identical in either case: proffering propaganda in a glossy 70mm package for handsome returns at the hustings, if not the box office. B-town is currently awash with all things political, having ushered in the New Year with two pol­itical subjects: The Accidental Prime Minister, based on a controversial book of the same name on former PM Manmohan Singh by his erstwhile media advisor Sanjaya Baru, and Uri, a high-­octane account of the Indian Army’s much talked about surgical strikes in September 2016. Also in the works are two biopics on none other than the Prime Minister. Vivek Oberai stars in one—Modi, an ambitious project expected to hit the screens in 23 different languages before the parliamentary polls. Almost simultaneously, veteran ­actor-turned BJP politician Paresh Rawal has announced another project on Modi. Also set for release is Thackeray. The biopic on Shiv Sena’s founder features Nawazuddin Siddiqui in the eponymous role. Unlike Hollywood, where political biopics have always flourished, Hindi cinema was wary of this genre in the past in view of the perceived disinterest of audiences, unnecessary legal hassles and the fear of a backlash. Barring an Aandhi (1975) here, a Kissa Kursi Ka (1978) there, and at most direct, the melodramatic 1984 Rajesh Khanna-starrer Aaj Ka MLA Ram Avtar, only few films on politicians were attempted. But today’s filmmakers are not averse to even turning the pages of history to dig up a riveting political plot with the hope of making the most out of the election year. Critics attribute the reason behind the sudden spurt in such films to the political agenda of either the filmmakers themselves or the people funding such projects. Thackeray, for instance, has been written and co-produced by Shiv Sena MP Sanjay Raut. A similar motive has been attributed to the makers of The Accidental Prime Minister starring Anupam Kher as Manmohan Singh. 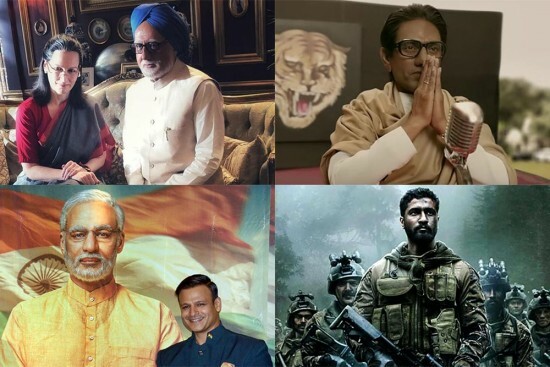 Political biopics are the flavour of the election season not merely in Hindi cinema but also entertainment industries on the other side of the Vindhyas. N.T.R. Kathanayakudu, a Telugu biopic of former film star-turned-chief minister N.T.R. has already hit the screens. On February 8, its second part, NTR Mahanayakudu, tracing the legendary actor’s transition from films to politics in the 1980s will see the light of day. The film stars NTR’s son, Nandamuri Balakrishna, in the titular role. The two-part biopic may or may not boost the fortunes of the Telugu Desam Party (TDP) founded by NTR, but there could not have been better timing for their release. Like most political ventures, the film also has a rival. A YSR Congress leader, has already initiated the counter-attack by producing Lakshmi’s NTR, another movie on the late Andhra icon. Directed by Ram Gopal Varma, it will—as its title suggests—explore NTR’s marriage with Lakshmi Parvathy, which subsequently led to the split in the party. YSR Congress also has its own hagiography—Yatra, a biopic on party founder and former CM, the late Y.S. Rajasekhara Reddy. Ready for release on February 7, it has Malayalam superstar Mammootty playing YSR. In adjoining Tamil Nadu, a biopic on former CM, the late J. Jayalalitha, starring Nithya Menon, is in the pipeline. Directed by A. Priyadharshini, The Iron Lady has been planned as a multilingual. Its shooting will commence on the birth anniversary of Jayalalitha on February 24.